Well I am a singer, actor (I prefer actress – but will go with the industry standard here) living on Cape Cod who loves her family, theater, animals (nuts about my dogs) magazines, movies, fashion, a great glass of wine, girl time, ice skating, avocados and I am a self-proclaimed (and proud) coffee junkie. Some of my Favorite roles include Belle in Disney’s Beauty & the Beast, Fantine in Les Miserables, Beth March in Little Women (HJT), Maria von Trapp in The Sound of Music, Lily Craven in The Secret Garden (HJT) and Marian Paroo in The Music Man, Edna Edison in The Prisoner of Second Avenue and many more! 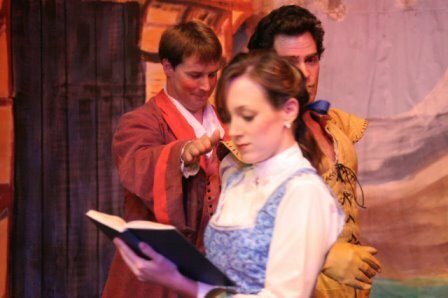 I am currently on stage reprising my role as Belle for the third time! I have a multi-generational Theatrical family – my 90 year old Grandfather is still active at the playhouse! I play a lead role in a documentary airing on PBS “Stage Struck” by Liz Argo. In my real life I am the Advertising Accounts Manager at Rabideau Media Group. I am celebrating my 30th year on the APA stage…and could not be happier!